The Boeing 777 ER Flight MH370 flying under Malaysian Airlines took off from Kuala Lumpur on March 8 at 12:41 am. It reached the altitude of 35,000 feet at 1:01 am. The last air-traffic control confirmed position was off the coast of the Malay Peninsula at 1:21 am. It then turned sharply, apparently heading back. From there the direction it took is not truly known but the plane seems to have flown for about 7 hours, thus exhausting all the fuel onboard. If it will be confirmed that Flight MH370 was airborne until engines flamed out due to lack of fuel, the case would bear striking resemblance to the Boeing 737 Helios Flight 522 that crashed in Greece in 2005 due to crew impairment, despite initial suspicion of a hijacking. 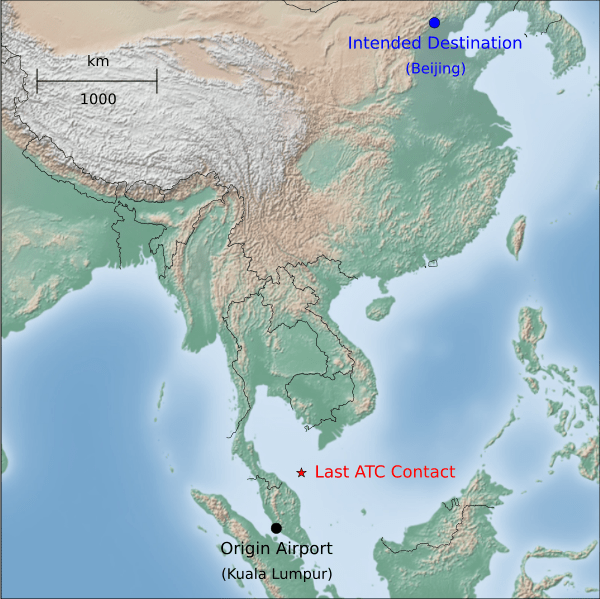 After its last communication Flight MH370 is thought to have crossed back over the peninsula (Credits: Wikimedia user Sailsbystars). The apparent erratic conduct of flight MH370 and the disabling of some communication equipment could be explained either by impaired pilot judgment typical of hypoxia (oxygen starvation) triggered by a slow cabin decompression, or because of the intervention of someone onboard with limited flight piloting experience who may have tried to replace the hypoxia incapacitated crew. The slow decompression could be due to an operational error, as was the case for Helios Flight 522, or because of structural failure. For the latter case it should be noted that following the discovery of a 40 cm crack on a B-777 on 6 March, just two days before Flight MH370’s disappearance, the FAA issued an Airworthiness Directive requiring inspection of B-777 fuselages for cracks at an antenna location that they said could lead to decompression. Should inspections reveal cases of cracks, in particular on B-777 variants structurally identical to that of the Malaysian Airlines Flight MH370, the slow decompression hypothesis would appear to be an increasingly likely explanation. In the operation of aerospace and other systems, oxygen is a friend or an enemy depending on quantity. Too much and anything can become flammable, too little and you get deadly hypoxia resulting in impaired judgment at the precise time it is most needed. 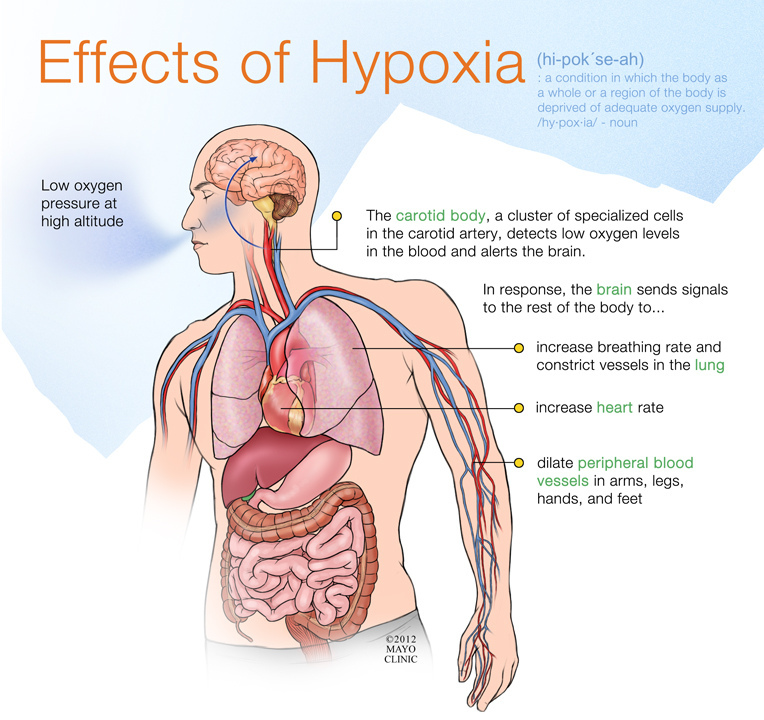 Click to see the physiological effects of hypoxia (Credits: Mayo Clinic). Hypoxia is a phenomenon that receives a lot of attention in aerospace medicine. The oxygen from air passes into our bloodstream through small sacs in our lungs called alveoli. Usually the partial pressure of oxygen in the alveoli (i.e. the pressure of the oxygen component of the gas mixture) is 14% (160 mmHg) when the air we breathe is at the usual 1 atmosphere (760 mmHg), at sea-level. The higher we climb into the atmosphere surrounding Earth, the lower is the partial pressure of oxygen in the alveoli. At a certain point we get oxygen starvation, or hypoxia. This is one of the reasons we fly in pressurized airplane cabins. A sudden failure of a pressurized cabin is generally very dangerous but immediately recognizable. It is accompanied by a good deal of noise as the higher pressure air in the cabin rushes out until the pressure equalizes with the external ambient pressure. This may be preceded by a loud popping sound. Dust and debris will be picked up and rush toward the opening where the pressurized air is rushing out. Items (and human beings) could be sucked outside the aircraft as happened on the Aloha Airlines B-737 in 1988. In contrast, a slow depressurization of an aircraft cabin may be not recognized until an automatic alarm sounds and oxygen masks deploy for passengers. The pilots may lose precious minutes looking for a false alarm, instead of immediately donning their oxygen masks. In those precious minutes, the most insidious effects of hypoxia would sneak in, affecting the eyes and brain. The retina of the eye is more demanding of oxygen than any other organ of the body — even of the brain itself which demands 30% of the overall supply. Vision would begin to degrade, in particular at night. Without supplemental oxygen at sufficient pressure the pilots gradually and progressively lapse into incompetence while maintaining an absolutely euphoric faith in their own ability. When blood oxygen saturation is down from the normal 97% to a dangerous 85%, colors fade and vision dims. There is a serious degradation of judgment, memory, and thought. The impairment of judgment leaves one feeling just fine and confident in one’s performance. Gradually one becomes more euphoric, belligerent, or disoriented and behaves irrationally, unreliably, and dangerously. Unconsciousness and death then follows. The airplane, without human control, may continue to fly until its fuel is exhausted and then crash. This precise sequence of events has happened already in a couple of cases. In one suspected case, a Learjet 35 in 1999 flew apparently without control for four hours. A confirmed case was the already mentioned Helios Airways 737 Flight 522 in 2005. A Helios Airways Boeing 737-31S at Ruzyne Airport (PRG / LKPR). This aircraft crashed on Greek soil on 14 August 2005 (Credits: Alan Lebeda). 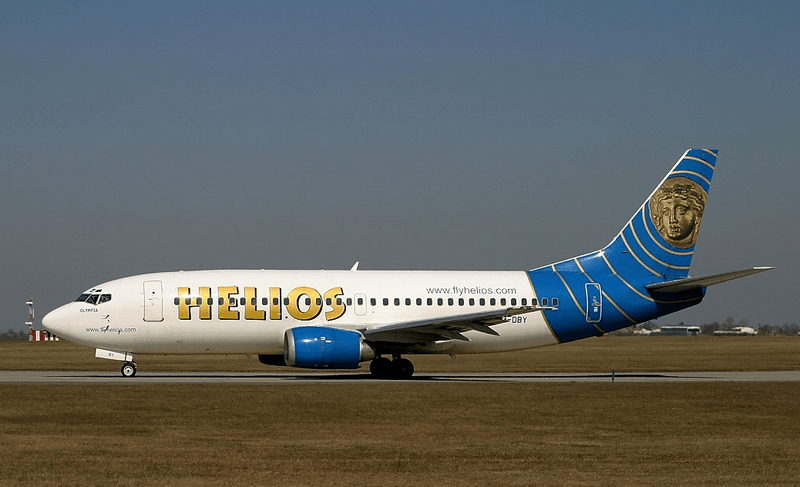 Helios Airways Flight 522 originated in Larnaca, Cyprus. It took off at 09:07 on 14 August 2005 and crashed into a mountain 3 hours later in Greece. A lack of oxygen incapacitated the crew, leading to the aircraft’s eventual crash after running out of fuel. Between 09:30 and 09:40, Cyprus Air Traffic Control at Nicosia had repeatedly attempted to contact the aircraft, but without success. At 11:24 two F-16 fighter aircraft scrambled by the Hellenic Air Force 111th Combat Wing established visual contact with Flight 522. They reported that the first officer was slumped motionless at the controls and the captain’s seat was empty. They also reported that oxygen masks were dangling in the passenger cabin, and there was no movement. At 11:49, a flight attendant entered the cockpit and sat down in the captain’s seat. His name was Prodromou and he held a UK Commercial Pilot License, but he did not have the training to fly the Boeing 737. Before he had much of a chance to try, both engines flamed out and the plane went down with all 121 passengers and crew. There were no survivors. Brilliant! Yes, I totally agree with you. Astonished there are so many other outlandish theories, when Hypoxia is so likely. IT’S FRIGHTENING TO LEARN THAT HELIOS TURNED INTO A GHOST AT ONLY 29,000 FEET, WHEN MH 370’S LAST CONTACT WITH THE GROUND WAS AT ALMOST 35,000 FEET. IN ADDITION TO THE FAA WARNING ABOUT CRACKS NEAR THE SATELLITE POD, THERE’S ALSO THE FACT THAT THIS PARTICULAR 777 WAS INVOLVED IN A WINGTIP COLLISION IN 2011 AT AN AIRPORT IN CHINA. THE STARBOARD WINGTIP WAS REPAIRED, BUT THE ENTIRE WING HAD BEEN STRESSED. IT WAS DECLARED TO BE AIRWORTHY, BUT HOW THOROUGHLY WAS IT CHECKED? I don’t buy it, it;s like falling asleep at the wheel and driving through rush hour in washington dc, without hitting someone, for seven hours only to arrive at Disney land. How likely is that? Actually, with autopilot, it’s quite likely, as strange as it sounds. Autopilot on these big jets is quite sophisticated these days. Except, of course, they did NOT arrive at Disney Land. I saw the Air Crash Investigation episode involving Helios last December. When I heard of this incident, this possibility immediately came to mind. Being a former flight crew member, I am familiar with hypoxia, the effects, etc. As far as I know, with a slow decompression, it’s possible that everyone was passed out/sleeping by the time the masks deployed; if they did. The thing I can’t figure out is how anyone anywhere can read the license plates on the cars in my carport but a 777 can’t be located. That is still baffling to me. We actually wondered the same thing, Jonathan, and our investigation turned into a whole special report on the subject. We’re putting the finishing touches on right now and will issue it in the next few weeks. If you subscribe to our mailing list, you’ll be the first to know when it’s out. I’ll just say that it was quite eye-opening! I have issues with Helios 522. There are too many items in its time line that do not make any sense to me. 1) assuming that the pilots did not know the reason for the warning, why isn’t it procedure to immediately wear oxygen masks and THEN perform necessary checks? Why is it left up to pilots to make the decision to wear an oxygen mask? 2) if the cabin crew was incapacitated by about 9:20, except for the two of them (who happened to be a couple), why did they only enter the cockpit at 11:49? Once the oxygen masks deployed in the passenger cabin, why did they not attempt to contact the cockpit crew one they noticed that they were still climbing despite every one only having 12 mins of oxygen? 3) assuming they did not know the code to the cockpit, but as they did have a portable oxygen supply, why did they not supply oxygen to the cabin crew who did have it in order to gain access to the cockpit and raise a mayday call? While I don’t think that the MH370 flight played our exactly like Helios, I do believe there is enough evidence to think MH370 may have turned into a “ghost” plane at some point. A recent episode of Air Disasters on the Smithsonian channel provided a great deal more information / details regarding Helios 522, which answer most if not all of the questions asked by “guest”, below. (0) Repair technicians had been testing the plane prior to takeoff in response to some possible issues with an exit door. In doing this they switched the cabin pressurization system from “auto” to “manual”, and then when done testing LEFT it in manual. The pilots did not notice. As the plane gradually gained altitude, they (and the passengers and flight attendants) began to get confused and lose their good judgment. (1) The two pilots were already suffering from impaired judgment when the alarm sounded. They MISTOOK the low cabin pressure alarm for a DIFFERENT alarm, a warning regarding takeoff configuration. They repeatedly asked operations control by radio why the takeoff configuration alarm was sounding. It wasn’t long after that that both passed out. They didn’t realize they were facing low oxygen, so did not don their O2 masks. (2) The pilot-experienced flight attendant was in superb physical shape. Thus he lasted longer than others in the passenger area. He eventually realized the plane was not descending and the passengers were passing out, and made his way to 1 hour oxygen tank systems (there were 4 on board). He ended using up 3 1/2 of them during the flight. (3)The flight recorder revealed that he did try to get help via the radio, but the radio was tuned to the wrong channel (the site they took off from, not Athens where they were circling now), so he got no reply. He even gestured at the figher jet pilot when the pilot signaled to him. But no substantial communication occurred. There remain some open questions about some details of events, but a lot is known now that explains most of what happens. What I do NOT know is what if any changes in the 737 (and other aircraft?) were made to help prevent this from happening again. I don’t know of any. From the beginning MH370 I have mostly only given credence to HYPOXIA. Not sure why an O2 sensor isn’t one of THE most prominent readouts in a cockpit. You know violent decompression but a gradual lost of O2 is not really detectable and then too late. As here flight 522 – few logical actions.